According to its website, "the Kenya National Youth Service is a government department established by an Act of Parliament (Cap 208 Laws of Kenya) on 01 September 1964. The twin purposes were to create a pool of technical, disciplined and organized human resource to undertake national development programmes and to alleviate youth unemployment in both formal and informal sectors by providing skills necessary for employment while promoting national cohesion. These objectives remain relevant to date". Institutional principles or values are integral part of the National Youth Service culture which in turn creates a sense of identity, belonging, direction and purpose among its members. 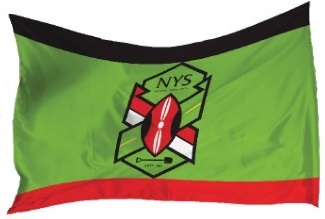 The flag of the Kenya National Youth Service comprises its logo in the centre of a central green panel, above which is a thin black stripe and below a thin red stripe as can be seen here.